TwelveSmallSquares: For I Am Man! Being a man i am possessed with a regular need to build and fix things. This mood tends to come in cycles where, after months of laziness, i suddenly decide to make some shelves for a cupboard, hang some mirrors on a wall or (in this case) convert a shed into a darkroom. As regular readers will know i recently moved house, downsizing from a 4 bed to a 2 bed house. Naturally the spare bedroom would have the computer in and all my guitars, instruments, amplifiers and pedals; and my large collection of cd's and dvd's. This left a minor problem - no darkroom. Originally the plan was to use the little breakfast bar area at the end of the kitchen but Jess didn't seem to happy with this. Being the devious, scheming lady that she is she suggested i get a shed - a suggestion i immediately dismissed as foolish. However, as days went by i began warming to the idea. 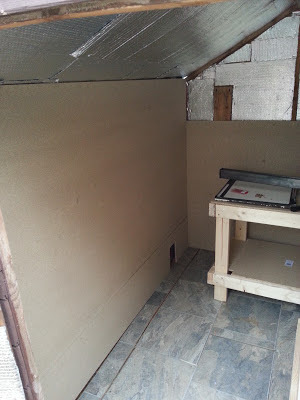 Could a shed make an effective darkroom? I began to investigate online and saw that it could indeed be done - but at great cost. I found a few articles where people had converted a shed into a darkroom but they had gone the whole hog - electric supply, running water, insulation panels, kitchen units etc. I needed to do mine at as small a cost as possible but still make it useable. First things first - find a shed. I went to B&Q because i needed to get some gear for decorating the new house. 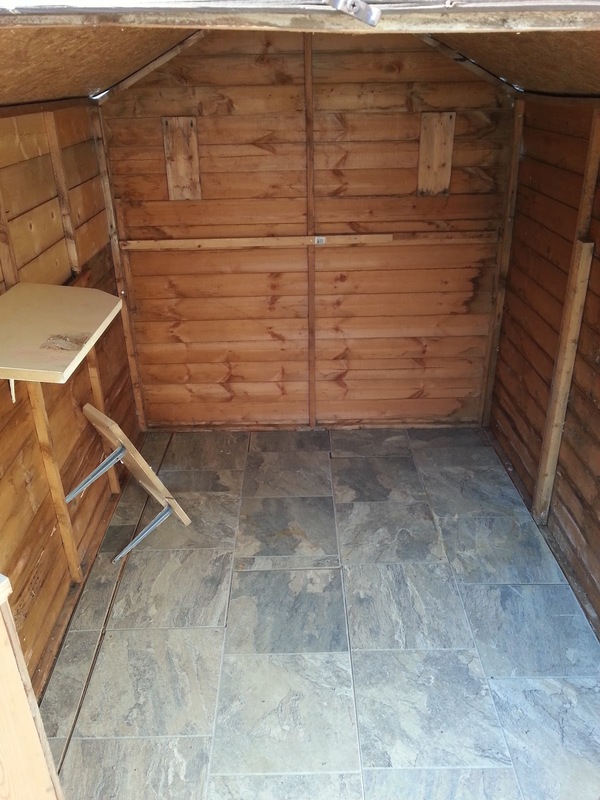 Special offer on a 4x6 shed - £120. I considered it for a while but then came to the conclusion that it was too small. I hit EBay and found a few but they were all too far away for me to collect. I tried Preloved and Freecycle but to no avail. Then i found one on Gumtree a mere 10 miles away. It was an 8x6 and it was listed at £175 or nearest offer. I offered £150 and got it! The next problem was how to get it home. Enter my good friend Steve who has a nice big estate car with roof racks. We went to the house, dismantled the shed, loaded it onto the roof racks and took it home. 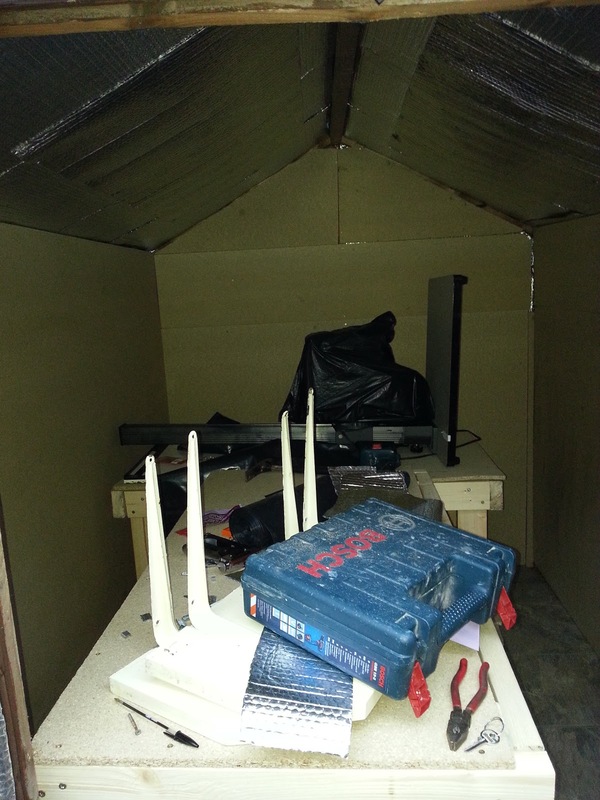 As a side note let me just say that if you ever need to dismantle a shed make sure you have an electric screwdriver. And make sure the guy you buy it off doesn't keep letting the shed walls drop onto you - it hurts! t in this photo but i also stapled insulation to the inside of the doors as there will be a lot of heat loss through there. I had about half a roll spare so i put an extra strip over each side of the roof as this is where the majority of heat loss will be. Next i had to board the roof. Now, at such an angle 12mm chipboard was going to be a pain. I just needed something to go over the insulation to add that little bit extra. Preston Plywood came through again with some 3mm MDF/Hardwood. I got two sheets delivered and cut them down to size myself. It was easier not to saw them, i just used a sharp blade and scored down the sheet so i could just bend the wood and snap it in the right place. I commandeered Jess to help me hold the sheets while i screwed them to the roof. It was awkward but we got it done eventually. So, that was the whole inside of the shed boarded out now. Although it was only cheap and thin insulation you could feel the difference in temperature compared to how it was with nothing on. obviously, more expensive and thicker insulation would have a greater effect. 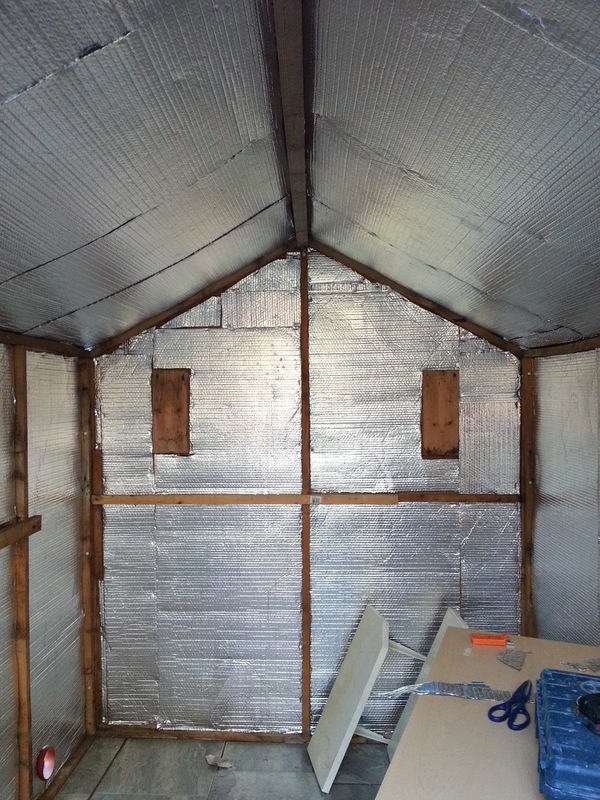 Insulation has a thermal resistance rating - the higher the rating the more insulation you get. This stuff only has a rating of 1.5 but it is certainly enough to make a difference, especially with board covering it. At this point i turned my attention away from the shed and began to think about workbenches. I'd need somewhere to put my enlarger and a surface to put my developing trays etc. I thought about using computer desks, kitchen units and even considered buying a workbench. it's shocking how much workbenches cost! So, i decided to build my own. 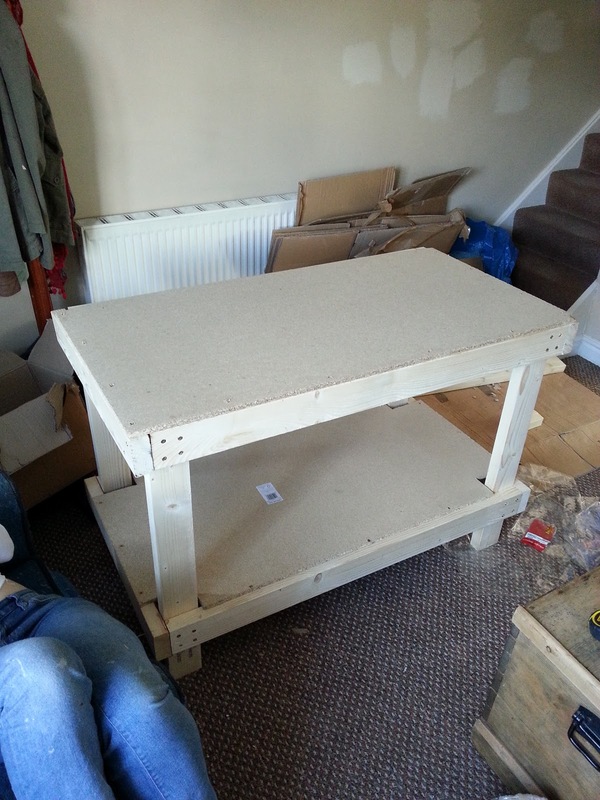 For about £35 i got the materials required to build my own 2 shelf workbench that would measure 1.2 x 0.80 x 0.60m. It was a squeeze to fit it all in the car but i managed it. I spent the afternoon sawing, screwing and assembling all the pieces until i had my bench. Solid as a rock and the perfect size. I was so impressed with it that i went ahead and built another one but made it slightly shorter so that my enlarger would fit on it. ...well, almost. I still need to figure out how to lightproof the vent but still pass an extension cable through it. and i still need to lightproof the doors. Ill probably velcro some lightproof plastic over the inside when i'm in and hang a curtain there too to keep out some of the cold when the shed is locked up. 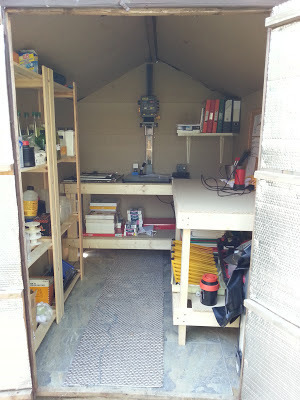 So there you have it - a darkroom shed on a budget. Hopefully this weekend ill be able to get in and start making some prints. If there are any improvements i need to make i can do it as i go along. It's nice and roomy though and i think i'll be happy printing in there. The main thing is that, should we ever move house (which i have no plans to do), i can dismantle it and take it with me. I really have to thank Jess for coming up with the suggestion and managing to cook me a delicious tea everyday despite the kitchen being full of darkroom gear! I don't know what my next bit of DIY will be (probably making some shelves for our towel cupboard), and i'm sure the mood won't strike again for many a month; but i know that when it does i'll be unstoppable - for i am man!